Actions consumers can take to save energy and money. Evaluations of such programs across the country have shown that they help consumers save energy and money. Opower, an Arlington, Virginia-based software company that promotes efficiency worldwide, works with several Illinois utilities to create the reports. How Are the Reports Prepared? The reports use utility information about your usage, along with publicly available data about the housing and energy characteristics of the area in which you live. The report doesn’t compare you to a specific neighbor, or even necessarily to neighbors on your block, but to a random sample of about 100 homes in the general vicinity that appear to be occupied and have similar characteristics, such as size and heating source. Utilities say research shows that for most customers a 100-home average is a good indication of typical usage. Home Energy Reports are generally accurate. But there may be inaccuracies with the data used to generate certain individual reports. For example, the publicly available square footage data for a particular home might not be correct. If you suspect there is an issue with the data used to create your report, contact the utility through the phone number or website provided on the report. Do Any Consumers Receive Reports that Give Positive Energy Usage Feedback? Yes. Consumers who receive negative feedback are vocal about the reports, but many other homeowners receive positive feedback. The utilities use the “smiley face” approach to energy efficiency because research has shown that neighbor comparison programs are an affordable and effective way to lower consumer usage and costs. Data show that the reports work by getting consumers to pay attention to their usage, and by educating them on how to use efficiency to save money. What Results do the Reports Get? Opower’s efficiency programs have saved consumers worldwide hundreds of millions of dollars, according to the company’s website. Research has shown that programs like this result in average energy savings of roughly 2 percent, which benefits all consumers because it helps bring down energy prices. All utility efficiency programs are evaluated to assess whether they are delivering the savings they have promised, and CUB monitors evaluation results and program proposals. Under Illinois law, the utilities’ efficiency programs are required to meet cost-effectiveness requirements, meaning their overall money- and energy-saving benefits must outweigh the small “energy efficiency” charges that fund them on our bills. Utilities face fines if they can’t meet annual goals approved by the Illinois Commerce Commission. CUB supports these programs specifically because research shows they are effective at helping customers to learn about and reduce energy usage so they can lower their utility bills. 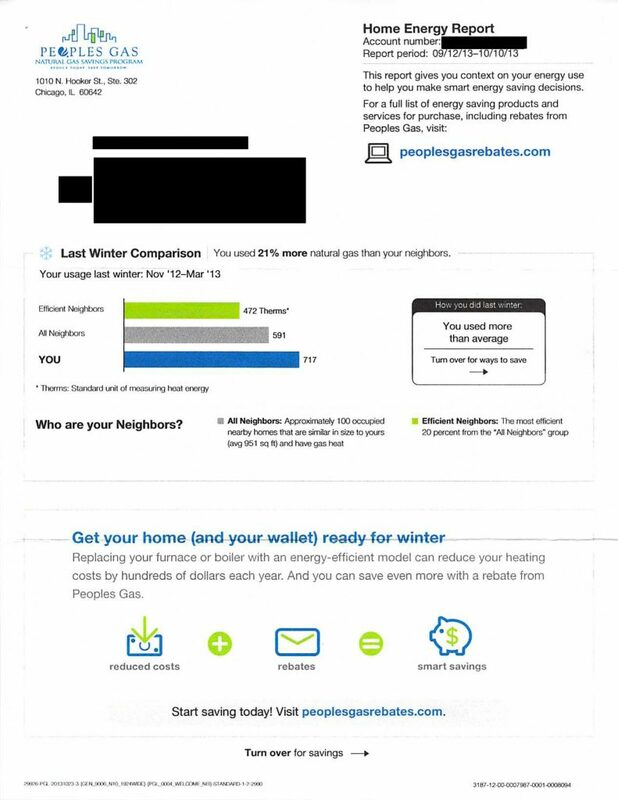 Do the Reports Give "Neighbors" My Personal Energy-Usage Information? No. Participants never receive any information that helps them identify specific homes. Yes. The reports include a phone number you can call to opt out. Are There Other Energy Analysis Tools I Can Use? You can visit CUB’s Energy-efficiency Incentives page, at www.CitizensUtilityBoard.org, for information about the utilities’ other efficiency programs, such as the furnace rebates and light bulb discounts mentioned earlier. CUB is Illinois’ leading nonprofit utility watchdog organization. Created by the Illinois Legislature, CUB opened its doors in 1984 to represent the interests of residential and small-business utility customers. Since then, the consumer group has saved Illinois residents more than $10 billion by helping to block rate hikes and secure refunds. For more information, call CUB’s Consumer Hotline at 1-800-669-5556.